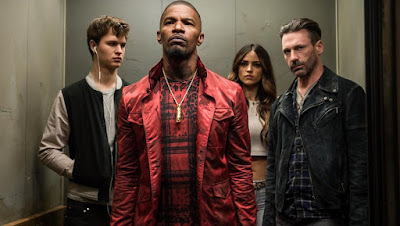 For all intents and purposes, writer/director Edgar Wright's BABY DRIVER is having a moment. Here it is, at the height of summer and, most of us still thinking that Wonder Woman is going to rule our lives at least through the end of August, then in comes this cool AF film, Think about it: it's an action/musical film that has not only defied genre expectations, but it's also re-imagining what musicals look like (like, re imagining them in a great way, not like La La Land). Honestly, I didn't really know what to expect from this film walking into it. I have to admit, I half expected a toddler behind the wheel of a car. 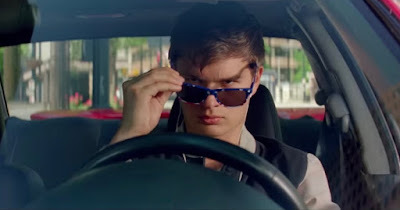 But no, it's a full-fledged adult (played by Ansel Elgort) with pouty pink lips and baby bottom-smooth skin burning rubber all over the highway in a car filled with criminals he's paid to chauffeur. How adorable. This will likely be the only action movie you'll ever see with a choreographer credit taking prime real estate in the opening credits and it has nothing to do with amazing stunts or fights scenes. It is actually rhythmic movement to the beat of your favorite old school jams. The strangely affable Baby (Elgort), not to be confused with Jennifer Grey in Dirty Dancing, spends most the movie tuning out his adrenaline-fueled lifestyle with his favorite songs that far exceed his years on steady rotation through earbuds -- putting him in a constantly chill mood and disconnected with the slimy thugs around him (played by Jamie Foxx, Jon Bernthal, Jon Hamm, Eiza González, and Kevin Spacey) he drives from crime scene after another. The other part of the movie he spends wooing his ladylove (Lily James) who --unsurprisingly -- works at a soda shop diner off the road, just like your favorite 80s music video crush did. It's literally like we've been transported inside one of Rick Springfield's songs, if Rick Springfield also offered more gunfire and explosions. It's utterly delightful. But what's most thrilling about BABY DRIVER is its soundtrack, which I alluded to above. You actually want to sing along to each of these songs! None of them is new, unless this is your first exposure to Barry White, Queen, and Martha and the Vandellas (in which case, shame on you), and Baby lip syncs each of them just like most of us do in the shower, except well. But this marks the return of a real film soundtrack that you actually want to seek out in a music store, er, on iTunes or wherever music is sold these days. Back in the day, there used to be myriad films with dope soundtracks (e.g. Boomerang, The Big Chill, Dirty Dancing, Saturday Night Fever, to name a few). That is, until around the 2000s when most were replaced with classical, purely instrumental, and moody tunes that you couldn't sing along to. That was a very long, and very dark time. In that sense, Wright has perfectly packaged the type of film that appeals to music lovers, romantics, and action aficionados across generations alike. He has created a musical earworm that just so happens to come with wild car chases and a fun story that has heart when you least expect it. I dig it.